Picture this: you just spent minutes perfecting your parallel parking so that you’re just close enough to the curb and have just enough distance from the cars in front and behind you. You go out, do your errands and come back to your car. The cars ahead of you and behind you are gone, giving you ample room to leave the spot. Unfortunately upon closer inspection, it seems the other cars left a little something: your bumpers have been SCRATCHED, KNICKED, DENTED. For such a small cosmetic blemish, getting it fixed turns out to be as costly as a full on-repair of something on your car. There are ways to save a little bit and a way to perform a not-so quick-fix as a do it yourself project. 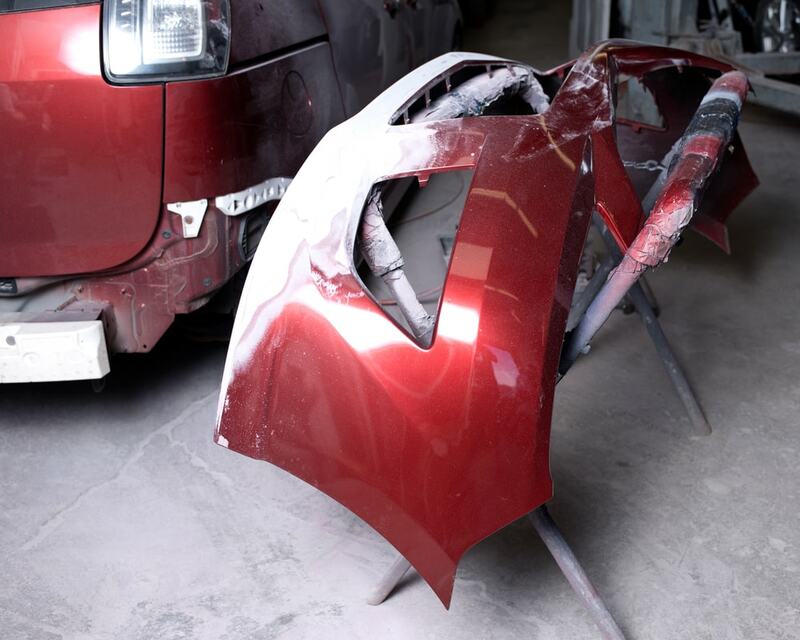 So yes, sprucing up your damaged bumpers involves a little effort in grinding, sanding, sculpting and painting. But figuring those steps out WILL save you. Too many vehicle owners end up heading to their local auto parts store for some really cheap body filler and a can of what they think is matching spray paint. This is a bad idea. Over the years the making of auto body parts has changed and thus you, the vehicle owner will need to adjust. It is a whole new set of supplies you need to gather in terms of fixing painted plastic/carbon fiber parts as opposed to the metal that used to be used to make bumpers. What’s interesting to note is the fact that when referring to a bumper you’re not actually talking about the part of the car that protects the front and rear frame of your car. 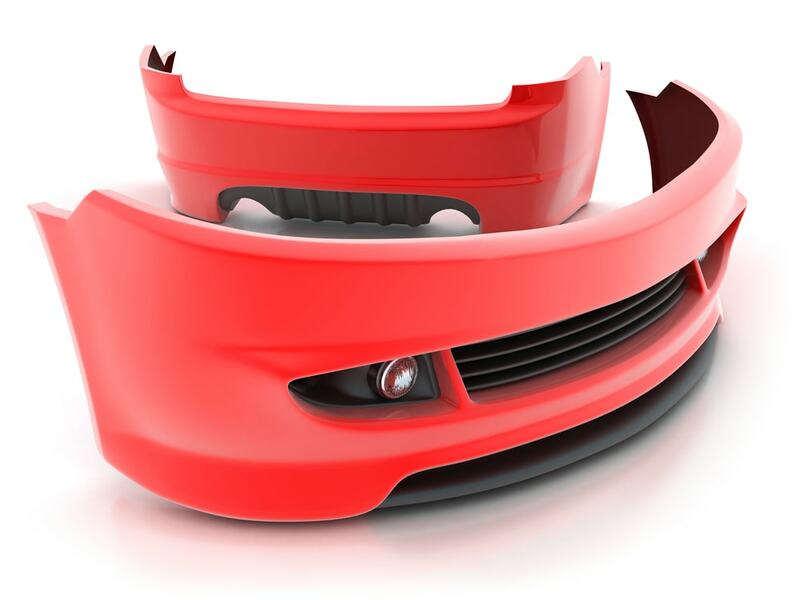 The actual “bumper” part of a front or rear bumper is what is hidden beneath that plastic or sheet metal that is prone to nicks and scratches. The thing is that the plastic covering was in fact designed for the express purpose of deflecting and deforming upon impact. Ok so you need to get that panel/covering off first. On most modern cars there are screws behind metal caps near the trunk latch, as well as screws under the lights and at the wheel wells. After removing those Once they were removed, we were able to slide the bumper’s tabs off a number of slots in the rear quarter panels. Look for screws or bolts under the trunk carpeting between the wheel and the rear bumper. Work in a warm, dry place. Keep in mind that no two bumpers are made the same way. Check the label inside to identify the type of plastic. The above materials tend to smear when ground or machine sanded. PUR (polyurethane plastic rigid) and TPUR (thermoplastic polyurethane elastomer) react to being ground or sanded by powdering up. With that out of the way it is time to choose your filler. Different fillers react to different materials and most of the time they will be labeled as such. As with most things cars: compatibility is important. Slightly scuff the damaged area before cleaning it with plastic surface cleaner. NOTE: if the area has been torn or pierced, you need to really scrub the surfaces inside and out. Wipe the area with a prep solvent. There’s a movement you need to remember: only one direction. This is to prevent dragging debris and dirt and making things worse. Mix equal parts of hardener and repair adhesive on a dish or cardboard of sorts. Wait for the solvent to dry. Once that happens be sure to sand the area by hand with 80-grit paper. 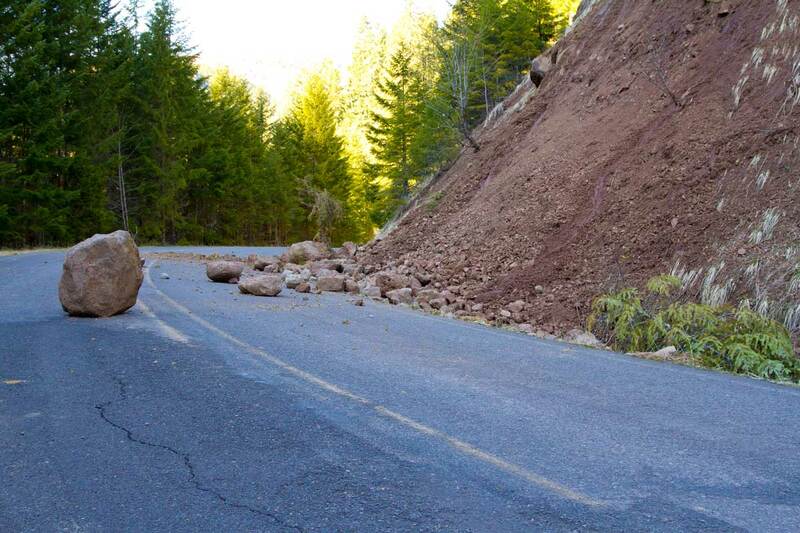 Form A “V” groove in the damaged area. What This does is allow you to align the two edges more easily while creating surface for repair material to stick. NOTE: Plastic types that powder when sanded need to have the grooves with a 24-grit disc on a sander. Plastics that smear when sanded can have the groves made through cordless drill and a rotary file. Repair tears and cuts from the back side of the fascia. If the cut or tear is large, you might have to align and then hold the edges of the repair with masking tape on the front of the fascia. Use self-stick fiberglass-repair tape to add structure to the cut or tear. Mix the adhesive and apply it over the tape with a body-filler squeegee. When the first layer of tape is in place, apply a second layer so the threads run at a 90-degree angle to the first layer. After the material has hardened, look towards the front of the fascia and remove any tape. With 80-grit sandpaper, sand off any excess material that has squeezed through. After you fill the cut or tear and any low spots in the front of the fascia with the appropriate repair material be sure to squeegee it. 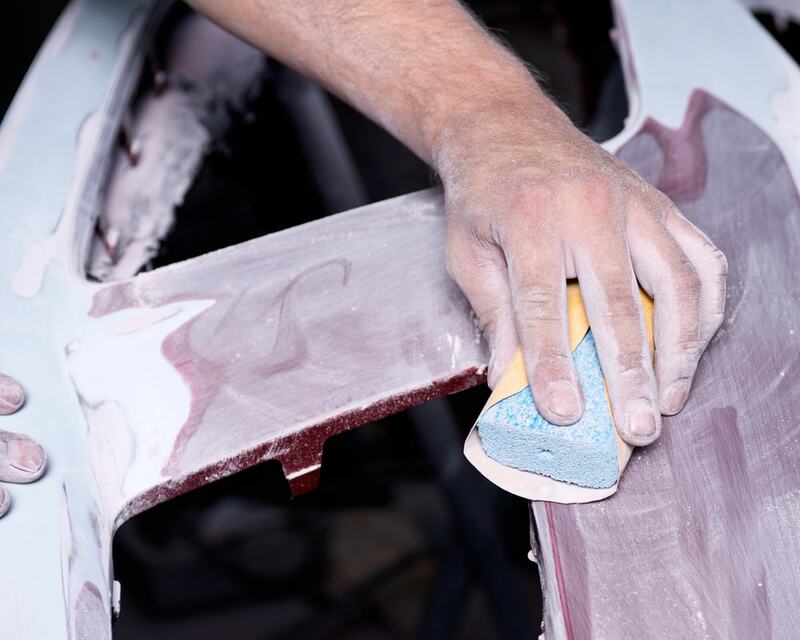 When all is done, use a light skim coat of repair material for pits and surface imperfection. This will restore the original contour before you finish sand with wet 400-grit paper. It will probably take two coats to restore contour properly. 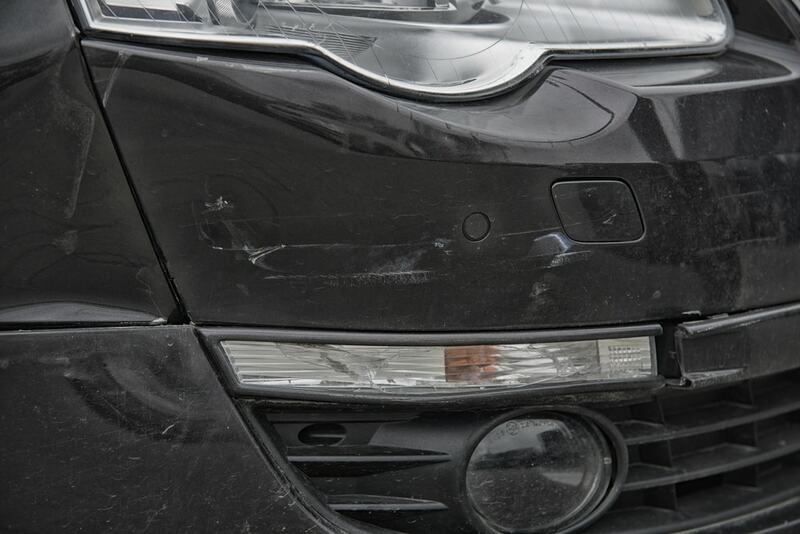 Congratulations, you’ve repaired your “bumper!” Give yourself a pat on the back. Now here’s the hard part: painting. After drying for 30 minutes, the fascia is ready for priming and painting. NOTE (read the labels and follow the maker’s recommendations for operator safety). 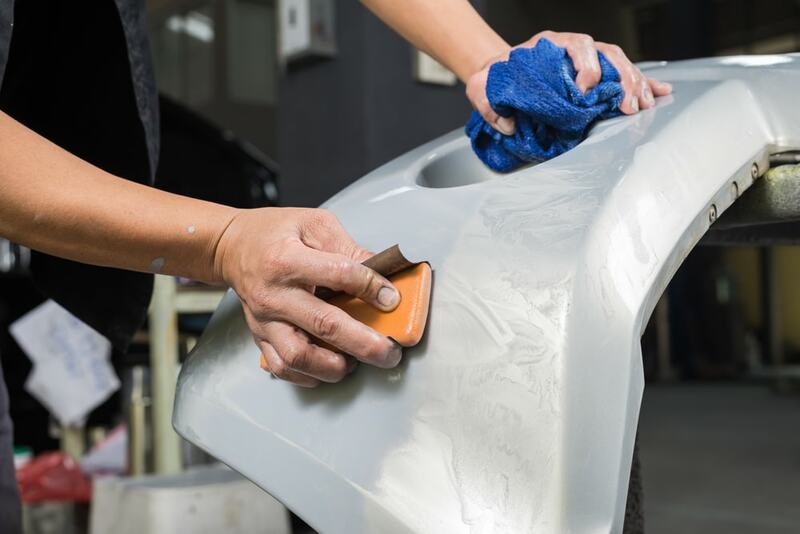 Prime the fender with two coats of any two-part primer-surfacer, making sure to let the primer dry between coats. After the primer has hardened, dry sand the repaired areas with 400-grit paper to level it and remove any imperfections. Eventually you will spray the bumper with basecoat. Keep in mind that first you have to wet sand it and then wipe the area with a tack rag in case of debris or dust. NOW you can spray the paint according to the manufacturer’s instructions. Repeat until the thing is covered completely and evenly. After the base is dry, mix the clear coat with hardener before applying two medium clear coats, allowing each to dry on their own. And that’s it. You’re done. Leave it over night before re-installing it and then using a buffer to remove imperfections.